In a simple twist of fate, Bob Dylan is not going to claim his Nobel literature prize after all. The Swedish Academy announced today that the 75-year-old American musician will not come to the Dec. 10 ceremony in Stockholm to retrieve his 2016 Nobel Prize for literature, ending weeks of will-he-or-won’t-he speculation over his attendance. The Academy said in a statement that it received a “personal letter” from Dylan, who cited “pre-existing commitments” for his absence. Dylan added that he wished he could pick up the prize in person. The Academy said, while the decision is “unusual,” Dylan isn’t the only laureate that hasn’t attended the ceremony. Doris Lessing, Harold Pinter and Elfriede Jelinek, for various reasons, have skipped the event. “The prize still belongs to them, just as it belongs to Bob Dylan,” the Academy said. By any measure, Bob Dylan is one of the most important and influential popular songwriters of his era. Now he’s also a Nobel laureate in literature, a choice that came as a surprise. Jeffrey Brown talks to singer/songwriter James Taylor and others about the way Dylan’s writing helped so many navigate a changing world. 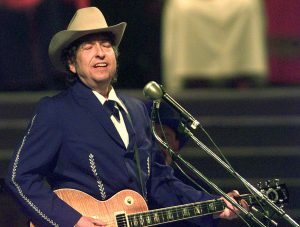 While columnists argued over the decision to award the literature prize to a musician, Dylan himself wasn’t in a hurry to acknowledge the honor. There was a brief all-caps line about the award on his official website that disappeared in 24 hours. The last American to win the Nobel Prize in literature was author Toni Morrison in 1993.